First year marine and mechanical engineering students at University of Plymouth have taken to the water and the skies for the first project of their studies. More than 150 students were challenged to create prototypes of boats or planes using high-tech design software, laser cutters, 3D printers and a range of materials. Their creations were then subjected to a day of testing at the University, with the students competing against one another and analysing the effectiveness of their designs. The projects are part of an immersive four-week module, which aims to provide students with an insight into some of the many topics they will encounter during their course. 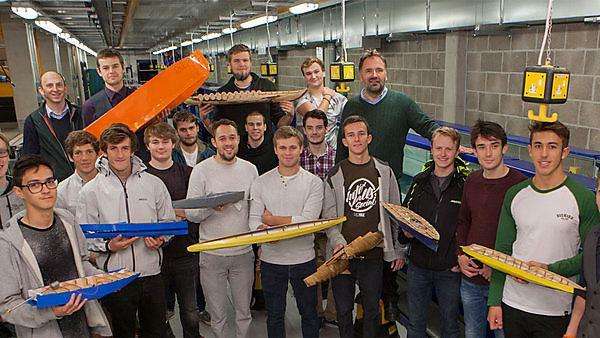 For the project, BSc (Hons) Marine and Composite Technology and BEng (Hons) Marine Technology students were challenged to design a boat that would travel a distance of 35 metres in the fastest possible time, both empty and carrying a 1kg weight. The vessels were then tested in the wave flume of the University’s Marine Building. Meanwhile students from the BEng (Hons) and MEng (Honours) Mechanical Engineering or Mechanical Engineering with Composites, and BSc (Hons) Mechanical Design and Manufacturing programmes turned their hand to aeronautical design, building monocoque gliders which were then fired from a catapult. All courses are accredited to appropriate levels of professional status. Within this subject area we offer a range of engaging and industrially relevant engineering degree courses.